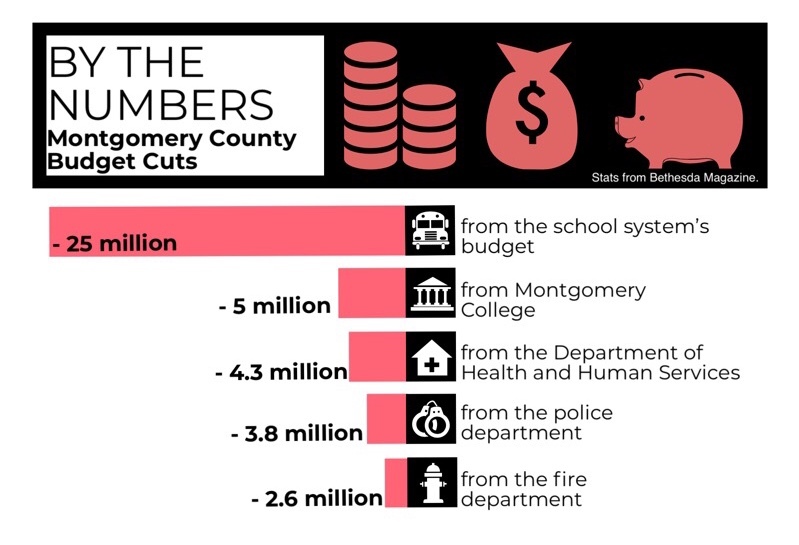 Montgomery County Executive Ike Leggett proposed a $25 million cut to the MCPS budget as part of a $60 million cut to the overall county budget Jan. 2. Leggett also plans to make large cuts to Montgomery College, the Department of Health and Human Services and the police and fire departments, along with a smaller cut of two percent to every additional department’s budget. The county’s income tax disbursement—a distribution of money collected from income taxes—from the state last fall brought in less revenue than expected, prompting the cuts. The BOE expressed uncertainty as to where the money will be taken from and awaits comment from Superintendent Jack Smith on how to address it, Bethesda Magazine reported Jan. 3. Principal Alan Goodwin believes that the shortfall could affect schools in multiple ways. The county will take additional cuts to its budget, as the first round of cuts only addresses half of the budget shortfall, Jennifer Hughes, director of the county’s Office of Management and Budget, said. If the cuts aren’t administered within this year, Leggett will roll them out during the 2019 fiscal year, which already faces a $86 million shortfall at the county level. Last school year, the BOE approved a $64 million increase to the county operating budget, but the cuts will halt these plans. MCPS hasn’t decided how to address the approved budget increase from the previous year yet, school board President Michael Durso said. Some teachers expressed concern over budget cuts yielding larger class sizes, government teacher Colin O’Brien said. Goodwin hopes the cuts don’t interfere with students’ ability to learn, he said.